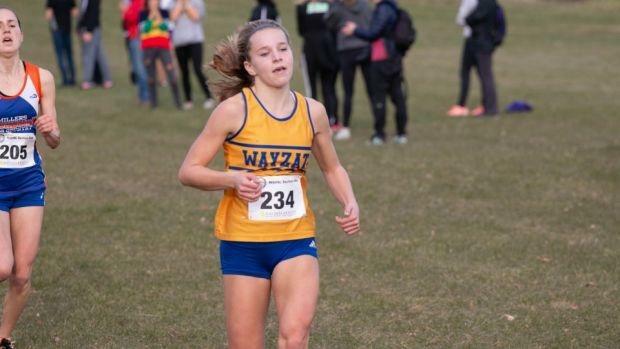 The Wayzata girls cross country entered the Roy Griak Invitational in late September with all the confidence in the world. The Trojans were undefeated, had raced well, and were ranked No. 2 in the country by MileSplit. But things didn't go so well at Les Bolstad. By the time the race finished, the favorites had fallen to fourth, beaten by three out-of-state teams from Illinois, and it seemed like the veneer was ripped off. "Anything can happen on a course like that," Wayzata coach Dave Emmans said a day before the race. But in the weeks to come, the Trojans regrouped. There was no precipitous drop in form. The team rested up, won the Lake Conference Championships with a few members out of the lineup and then put its foot on the gas pedal at the MSHL Section 6AA Championships, winning a quality race over Edina, Eden Prairie and Minneapolis Washburn. There was little doubt it was the best performance to date for the Trojans. And that was important, because the Minnesota State High School League Class AA Championships arrive on Saturday at St. Olaf College. But what the result at Roy Griak boiled down to was this: It was an honest assessment. "Are we that good?" Emmans asked of the national ranking ahead of Griak. "The real answer is that we don't know. (But) it put a little pressure on us. The girls won't say that it did, but I will say it did a little. And we're starting to wrap our head around that a little bit." Maybe the loss allowed the team to finally relax. At the section championships, it looked as if the squad did just that. Putting all five of its scorers in the top 15, the Trojans, who are now ranked No. 9 on the MileSplit50, averaged 18:21 over 5K and took down a strong Edina squad that continues to improve. And junior Caroline Sassan was back to her old self, shaking off a tough Griak race to finish eighth overall in 18:18.10. Before the season, Wayzata was strong even without Nechanicky. But with three legitimate runners who could be No. 1s anywhere else, it now gives Emmans a dangerous trio that could still make Wayzata power player at the next level. And Wayzata does in fact have a national title on its resume. Back in 2013, the Trojans became the only team over the last 12 seasons to uproot Fayetteville-Manlius at Nike Cross Nationals. "The dynamic of the team will change from year to year," Emmans said. "Sometimes it's a little slower putting that concept together. You don't want to inhibit anyone's individual talent to say you have to run in a pack. Over the years it's come together." Emmans won't deny that Wayzata has a tendency to get out slow. It hurt the team at Griak, when the girls field of almost 500 swallowed the Trojans and made it more difficult to break free. Though to be fair, the squad still ran pretty tight on the Les Bolstad Course, as its 3-4-5-and-6 all finished seven seconds apart from one another. But points matter, and Wayzata was displaced by too much. And yet, sometimes losses can help shape a team, too. "The big races we compete in teach us a lot," junior Rhynn Paulsen said. "There's going to be really good teams, especially Naperville, at big races. But it helps us understand what each of our roles are on the team." "We're really focused on the journey and the process," she added. "The every day things drive us, like doing the little things, which will end up at the end of the season. The goals at the end of the day are still as sky high as ever for Wayzata. The Trojans want to win their second straight Class AA title, and eventually qualify for NXN down the road. "We all set really high goals for ourselves," junior Emma Atkinson said. "Setting these goals will make us feel motivated to work hard and accomplish them, because we just want to be accomplish them."